The New Trixon Vertikalen Cocktail Kit! Vertikalen, or “vertical” in english – is how the German designers of this kit established its layout. The main function of the Vertikalen Kit is to bring a full size snare into the same small footprint of the standard Trixon Cocktail Kit. To do this the designers came up with a unique vertical mounting system that suspends the snare over top of the bass drum. 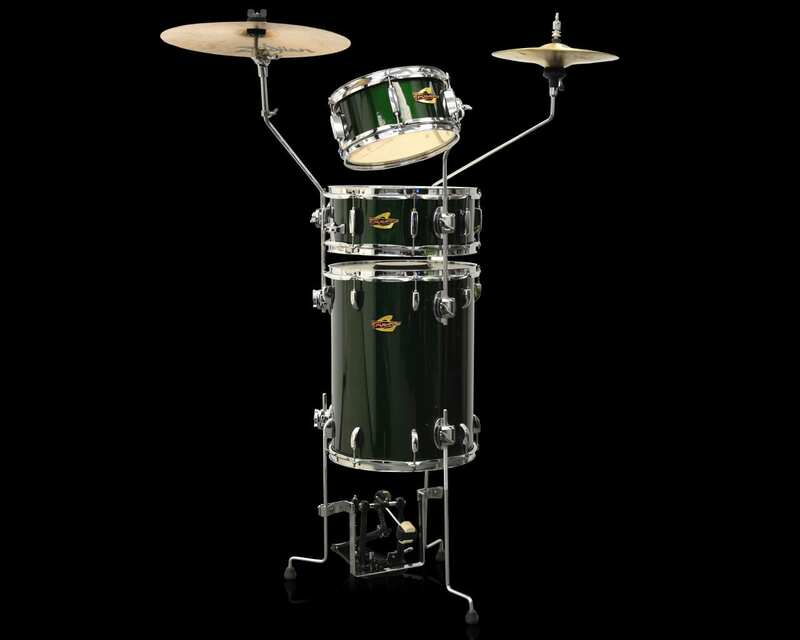 Suspension levels can be dropped to rest completely on the bass drum or more than 2.5” above it. This will allow you to change how much of the tone is fluid throughout the Vertikalen stack. Included in the kit is a rubber dampening pad that adds even greater tonal depth adjustment to the kit. This pad can be removed an installed within seconds and creates a barrier between the bass and the snare. This is a great kit for gigs, street playing and where ever else you don’t want to haul a complete 5-piece kit with you. The Vertikalen Cocktail Kit disassembles in minutes and can fit in the hatch of any compact car! Try that with your standard kit!